ABBA fans are confused and concerned today after listings for vinyl versions of ABBA’s 8 albums appeared in the webstore on the official ABBA website, for release on August 1st. The listings on the website show the covers and tracklistings of the 2001 CD reissues, except for 1975’s ABBA album which erroneously shows the tracklisting for ABBA – The Album. Meanwhile, a newsletter from Bengans.se announcing the LP reissues includes an image that shows three of the albums with the old, unpopular Polydor CD covers. The ad declares the albums to be “as originally prepared by ABBA” and “mirror[ing] the original Swedish releases”. 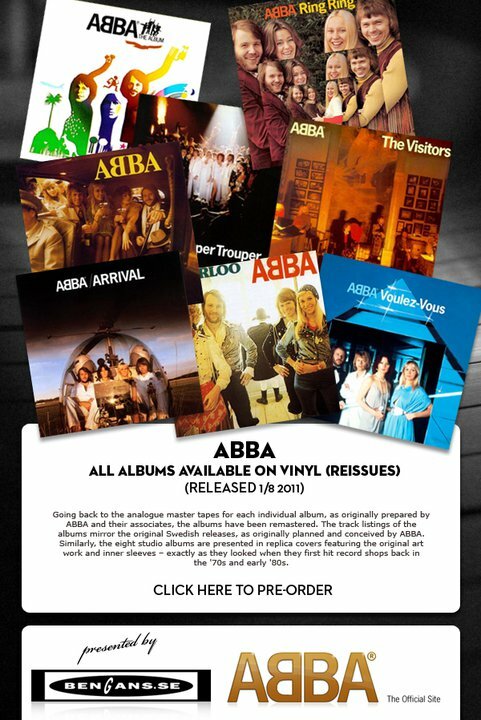 It appears that Bengans, the company that runs the webstore on the ABBA site, has jumped the gun on the announcement of these vinyl reissues, but has copied the covers and tracklists from previous CD listings, not realising they will be different. The listings on Bengans’ own website are identical to those on the ABBA site, right down to format and even the order the albums are listed. Expect an announcement soon on the ABBA site that these eight reissues will be the same as the LPs included in last year’s The Vinyl Collection box set. In fact the individual albums were seen for sale in Bengans’ store in Drottninggaten, central Stockholm’s popular shopping street, several weeks ago.